Fit Me® Concealer is makeup for flawless, natural coverage under the eyes or for over blemishes. This oil-free concealer matches skin tones to deliver a more even complexion. Skin looks perfected with this natural coverage, liquid concealer. The oil-free concealer formula conceals redness, flaws, dark circles, puffiness, bags and blemishes. Matches all skin tones. Has been Dermatologist tested and Ophthalmologist tested. Is a non-comedogenic concealer. Is also fragrance-free. To use: Dot concealer onto imperfections or under the eyes. Pat with a finger to blend. Comes in 12 super saturated shades. I use Fair which is 1.0. The lightest shade. I use that shade under my eyes. On the rest of my face I used Ivory 0.5, the next darkest shade on the rest of my face. It is better to use a lighter color on under eye area to lighten the under eye area to lighten it up. 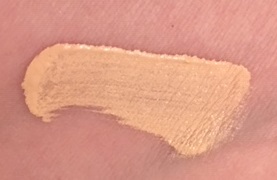 This concealer covers well, is easy to apply and has good pigmentation. It will leave your under eye area covered, light and bright. And flaws are erased, covered and definitely not able to be seen. Maybelline Fit!Me Concealer retails for $6.49 and is available at mass market retailers such as Walgreens, CVS, Rite-Aid, Target, Walmart and also Ulta. Online it is available at www.ulta.com. Like Maybelline on Facebook: https://www.facebook.com/maybelline; Follow Maybelline on Twitter: @Maybelline; Follow Maybelline on Pinterest:http://www.pinterest.com/Maybelline/; Follow Maybelline on Instagram:http://instagram.com/maybelline# and Follow Maybelline on Tumblr:http://maybelline.tumblr.com/.